Kesar Angoori Petha is the world famous sweet of Agra, India. It is made by drying pieces of ash gourd in lime water, then cooking these pieces in sugar, which adds to its sweet flavour while acting as a natural preservative. Kesar Angoori Petha is dipped in Sugar Syrup to give a scintillating feeling to the taste buds after being refrigerated at temperature 5-15 degree Celsius. A juicy Petha dipped in sucrose and sprinkled with pure saffron brings about unmatched quality and purity in taste. 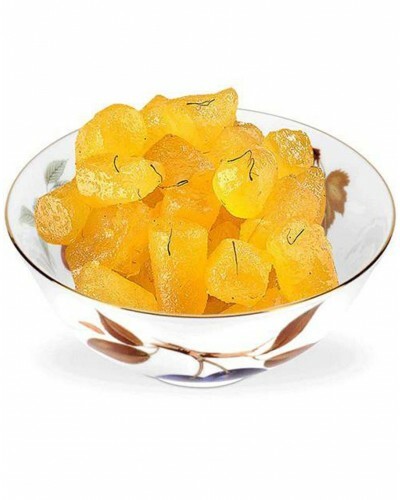 It is one of the largest selling varieties of Agra's Petha. This Petha is flavoured with Kewda essence & elaichi is one of the best variations of Agra's most famous sweet tempting dessert. Not only is it delicious and contains fruit fiber, it is also very healthy. Petha contains iron, calcium, sulfur, and Vitamins A, B, C, and E, as well as protein.